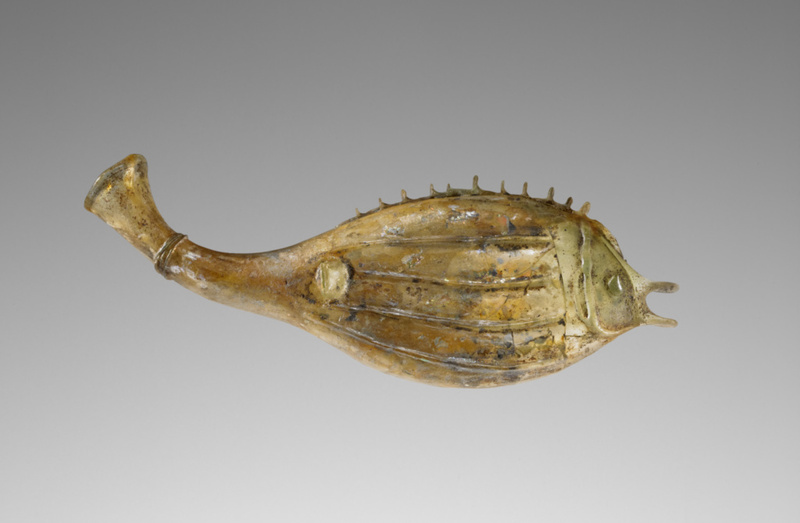 Free-blown flask of pale green glass in the shape of a fish. Deflated to achieve the flat fish body, neck bent to form the tail. Mouth pinched into two protruding sections for lips. Molten glass trailed around the tail four times; a gather attached at the head and successively lifted and reattached, the ares of lifting then pinched to form the spine. Side fins added by attaching two gathers, themselves pinched. The eyes and back fins are formed with blobs of glass added on the sides. Heavily discolored, taking on a brown hue due to weathering. Erwin Oppenländer, 1901 - 1988 (Waiblingen, Germany), by inheritance to his son, Gert Oppenländer, 1988. Gert Oppenländer (Waiblingen, Germany), sold to the J. Paul Getty Museum, 2003. "Recent Important Acquisitions Made by Public and Private Collections in the United States and Abroad." Journal of Glass Studies 11 (1969), p. 110, no. 6, ill.
Saldern, Axel von, et al. Gläser der Antike: Sammlung Erwin Oppenländer, exh. cat. (Hamburg: Museum für Kunst und Gewerbe, 1974), p. 238, no. 697. Whitehouse, David. Roman Glass in the Corning Museum of Glass vol. 2 (Corning: The Corning Museum of Glass, 2001), p. 200.